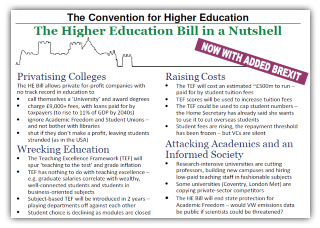 Parliament has opened its call for evidence for the Committee stage of the HE Bill, with a deadline of 18 September 2016 for submission of evidence. Early submission prior to Tuesday 6 September is ideal, as this date will be the first date the Public Bill Committee meets. See below for how to submit this evidence. Do you have relevant expertise and experience or an interest in the Higher Education and Research Bill which is currently passing through Parliament? If so, you can submit your views in writing to the House of Commons Public Bill Committee which is going to consider this Bill. 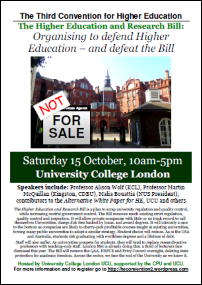 The Higher Education and Research Bill 2016 implements the legislative proposals in the White Paper and seeks to bring forward a range of measures with the aim of increasing competition and choice in the higher education sector, raising standards and strengthening capabilities in UK research and innovation. Part 1 (clauses 1-77) establishes a new body, the Office for Students (OfS); the OfS will act as the regulator and funding body (teaching) for the sector; the Higher Education Funding Council for England will be abolished and the Office For Fair Access will be merged into the new body. This part also creates a new single entry system for higher education providers, this will operate through a new register of higher education providers and by changing criteria on the granting of degree awarding powers and UT. Part 2 (clauses 78-82) contains measures to create new alternative payments; these payments will be non-interest bearing student finance. This part also contains provisions on the deregulation of higher education corporations. Part 3 (clauses 83-102) makes changes to research infrastructure which will enact some of the recommendations in the Nurse Review of the UK research councils. The provisions will create a new body, UK Research and Innovation (UKRI); the seven research councils and Innovate UK will be integrated into UKRI along with a new body, Research England. The Bill and accompanying documents are available on the Parliament website at Higher Education and Research Bill 2016-17. The Bill was presented to the House on 19 May 2016. On Tuesday 19 July, the Bill received its Second Reading in the House of Commons where MPs debated the main principles of the Bill. The Bill has now been sent to the Public Bill Committee where detailed examination of the Bill will take place. The Bill Committee is expected to hold oral evidence sessions on Tuesday 6 September. The Committee is expected to meet for the first time on Tuesday 6 September 2016; it will stop receiving written evidence at the end of the Committee stage on Tuesday 18 October 2016. Please note that when the Committee reports it is no longer able to receive written evidence and it can report earlier than the expected deadline of 5.00pm on Tuesday 18 October 2016. Essential statistics or further details can be added as annexes, which should also be numbered. To make publication easier, please avoid the use of coloured graphs, complex diagrams or pictures. As a guideline, submissions should not exceed 3,000 words. Please include in the covering email the name, address, telephone number and email address of the person responsible for the submission. The submission should be dated. The written evidence will be circulated to all Committee Members to inform their consideration of the Bill. Most submissions will also be published on the internet as soon as possible after the Committee has started sitting. Material received in July and August should therefore be published after 6 September. The Scrutiny Unit can help with any queries about written evidence. © Parliamentary Copyright. Republished under the Open Government Licence. This entry was posted in HE BIll and tagged higher education, Office for Students, privatisation, TEF, white paper. Bookmark the permalink.